After losing her first child to preventable diseases, Luz Maria was terrified when her young daughter Emily became sick years later. But with the support of Compassion’s Child Survival Program, little Emily’s story is one of hope rather than tragedy. Hidden away in the centre of the Sierra region of Ecuador, in the cold province of Bolivar, is a small indigenous community called Paltabamba. Most of the families who live here are poor farmers depending on seasonal crops. While the men work on their own land or as construction workers, the women care for their children at home. There is no sewage system or potable water, so sicknesses such as diarrhoea are common among children. Luz Maria knows this all too well. She felt helpless when her 20-month-old daughter fell ill.
“She was one year and eight months old, and she was vomiting, with diarrhoea and fever,” says Luz Maria. Devastatingly, a few years later Luz Maria found herself in a similar situation with her younger daughter Emily. But this time she wasn’t alone. The presence of the Compassion Child Survival Program in her community meant that when Emily became sick, help was at hand. 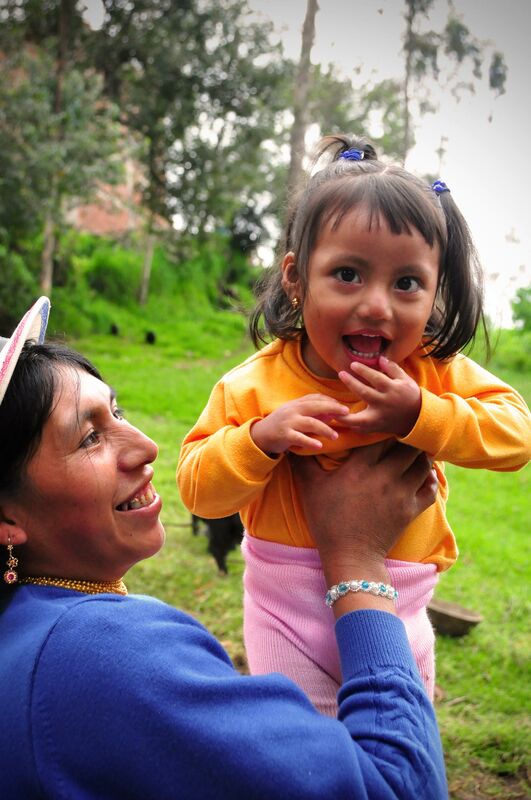 When Emily was born with a cleft palate, Luz Maria was told she needed surgery. As her husband only earned a small, unsteady income through temporary jobs, Luz Maria knew they could never pay for Emily’s surgery. “We didn't even have enough money for food and the child's medicine,” she says. As Emily grew, her cleft palate meant she struggled to eat and she quickly became malnourished. She couldn’t sit or hold her head up and she had no strength in her legs to start crawling. As she watched her daughter become weaker every day, Luz Maria searched desperately for a way for Emily to have the surgery. “Everything [she ate or drank] would come out her nose,” says Luz Maria. Eventually, Luz Maria found hope with Compassion. When the staff of a local Child Survival Program centre heard about Emily’s condition, they set to work to find a way for Emily to have the operation. “We were interested in finding a place where she could have surgery, and we found a foundation that could do it,” says staff member Maribel Maldonado. Emily’s operation was successful, and the Child Survival Program covered all the extra expenses both before and after the operation. She soon overcame her struggles to eat, and began to grow. But another hurdle for little Emily was just around the corner. One morning, Emily developed a high fever and started vomiting. Immediately Luz Maria rushed her to the Child Survival Program, who took her to the hospital. While doctors initially said Emily was fine, her condition soon worsened. Her temperature spiked so high it caused terrifying convulsions. Local staff stayed by Luz Maria’s side, determined to find what was causing Emily’s sickness. Finally, five hours from Paltabamba in Guayaquil city, Emily was examined by specialists and diagnosed with meningitis. Her condition was critical and doctors needed to act fast to save her life. With the added complication of pneumonia, Emily was induced into a coma. “I watched as she fought to breathe, and I thought she was dying,” says Luz Maria. Luz Maria watched on with fear in her heart as she realised Emily had the same symptoms that her sister had died from. She steeled her heart and prepared herself for the worst. But immediate medical intervention meant that Emily had a fighting chance. Little by little, day by day, Emily improved. “If the [Child Survival] Program had not existed, I don't know what our situation would be like,” says Luz Maria. With her mother’s determination and support from local Child Survival Program staff, today Emily is full of life. The vibrant toddler is becoming stronger each day and is learning to talk. Luz Maria’s heart is finally at peace.